Today the BBC reports that traffic police offices in Calcutta will be outfitted with oxygen devices as a way to counteract the ill-effects of air pollution. 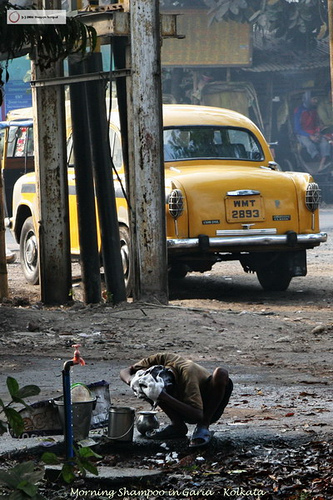 The news item cites a report by the Chittaranjan National Cancer Institute, one of India’s most respected research centers, that found that around 70% of Calcutta’s 18 million inhabitants suffers from respiratory problems, such as asthma, lung cancer, and breathing difficulties, much of it caused by pollution from the cities chaotic transport sector. Traditionally used in hospitals by sick patients undergoing medical treatment, the oxygen devices will now be deployed at the cities 11 traffic offices, where traffic officers who have performed an eight hour stint on Calcutta’s contaminated streets will be able to use them for up to 20 minutes. The article notes that one of the largest polluters on India’s roads are the auto rickshaws that are powered by a “deadly concoction of kerosene and petrol.” Can these rickshaws be made environmentally friendly? In Delhi, another mushrooming Indian City, officials have begun a program to replace old polluting rickshaws with ones that run on clean burning natural gas. To learn more about this project, click here.